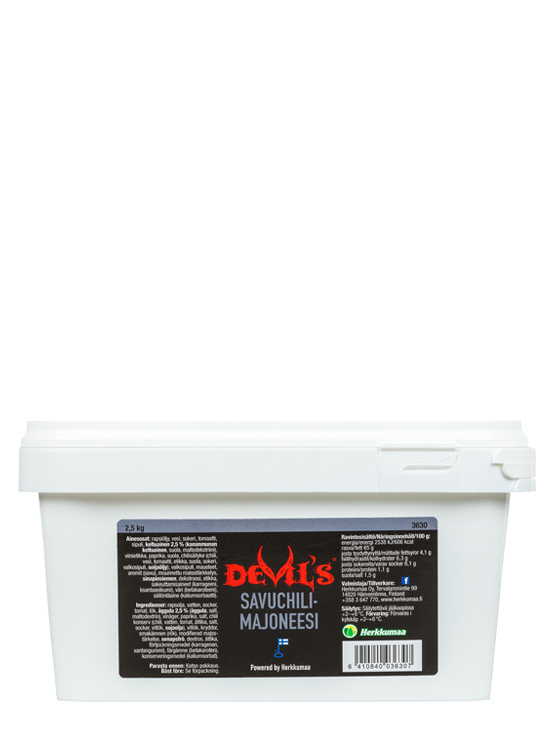 Lightly smoked and pleasantly hot Devil’s® smoked chilli mayonnaise is a guaranteed winner. This Tex-Mex-style chipotle mayonnaise can be used by itself as well as in salads and Mexican dishes. The lactose-free and gluten-free mayonnaise is available in a 2.5 kg package. Ingredients Rapeseed oil, water, sugar, tomato, onion, egg yolk powder 2.5% (egg yolk, salt, maltodextrin), wine vinegar, paprika, salt, pickled chillies (chilli, water, tomato, vinegar, salt, sugar, garlic, soybean oil), garlic, spices, smoke flavouring, modified corn starch, mustard seeds, dextrose, vinegar, thickeners (carrageenan, xanthan gum), colouring (beta-carotene), preservative (potassium sorbate). Storage Unopened package can be stored at room temperature, opened package in the fridge.